Lying deliciously at the intersection of engineering, design, eccentricity, and investment lies this work from Francois-Paul Journe. When a collection begins to get serious, annual or perpetual calendars often make the list. With extreme rarity, engineering provenance, and a five day power-reserve, this particular Octa Calendrier serves its clientele very precisely. 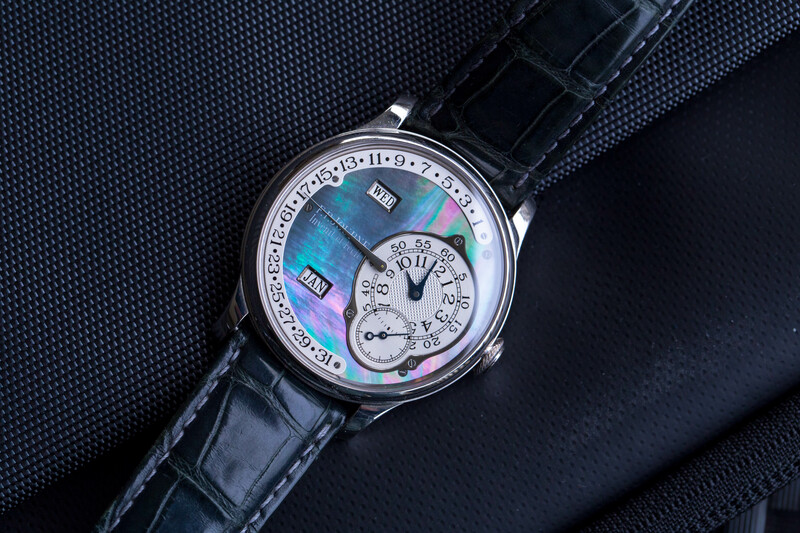 One of Journe’s accomplishments in this piece was the way he accomplished the annual calendar complication. His calendar movement is only 30mm in diameter and 5.7 high all told. This is substantially smaller than most and allows for more subtle dimensions overall. The one-off movement also has a smaller balance, a low torque mainspring, and an off-center rotor, allowing for very quick automatic winding of its substantial 120-hour reserve. This limited release platinum case and black mother of pearl dial variation sold out very quickly after initial release. The market definitely prefers limited release versions for investment purposes, and this finish should be no different. I find the dial’s light play simply artful, particularly in light contrasting the blued hands. You come by an FP Journe like this once or twice a year, so I wouldn’t expect it to hang around. Find it here from a private Swiss seller for 63400 USD.